On Tuesday 21st October an event was held in Castle Saunderson to celebrate the success of an education and networking programme called HATCH that was developed four years ago to support and develop entrepreneurship in the Border Region. Higher Attainment through Cross-Border Hubs (HATCH), an EU INTERREG lVA funded initiative, managed by the Special EU Programmes Body, was developed in collaboration with the Irish Central Border Area Network (ICBAN) as Lead Partner, Local Enterprise Office, Cavan (lead beneficiary) Business Institute of University of Ulster and South West College as programme delivery partners and and managed by Dympna McCarron and her team at Cavan Innovation & Technology Centre. It delivered targeted, accredited courses designed to meet the needs of the Construction & Engineering Sectors, Foreign Nationals and Female Entrepreneurs in the border region. In total participants came from the council districts of Cavan, Monaghan, Sligo, Leitrim, Donegal in the RoI and Armagh City & District Council, Cookstown District Council, Dungannon & South Tyrone Borough Council, Fermanagh District Council and Omagh District Council in Northern Ireland. The event was attended by the participants of the HATCH programme as well as stakeholders and representatives from right across the border counties. Speaking at the event Dympna McCarron, Programme Manager said, “A number of targets were set at the outset of the HATCH programme including promoting entrepreneurship; support of enterprises through training; enhancing employability; developing transferrable skills; increasing confidence and capacity; and collaboration via networking. I am delighted to report that the independent research company, First Western, have found that the programme has delivered against targets and in many cases exceeded all expectations against the targets set at the outset. To-date over 420 adult learners having participated in the HATCH Programme over the four years in 36 courses. These results together with excellent accreditation and retention rates are a testimony to the commitment and dedication of all those involved. There were a number of speakers at the celebration event including Shane Campbell, CEO of ICBAN; Vincent Reynolds, CEO Cavan Local Enterprise Office; Dr. John Moore, South West College; Michael McQuillan, University of Ulster; Enda Candon, CEO First Western who conducted the student research; Jerome Mullen, Hon Polish Consul in Northern Ireland; Miriam Byrne, Female Entrepreneur and CEO of City Analysts and Tomás O’Leary, Passive House Academy. Representing the students were Donata Simonaitiene, who successfully completed the English for Employability, BEC Accredited course as well as a tailored management programme; Claire McNamee represented the Female Entrepreneur Cohort; she has successfully completed the Advanced Diploma in Management Practice with the University of Ulster and Garvan Hanley, partner with Hanley Taite Architects who participated in a number of the Construction and Engineering programmes delivered by South West College. Dympna also told the paper how she was delighted with the support HATCH has received from local media, stakeholders and students over the course of the programme. It is the combined effort of everyone that has made this programme the wonderful success it has been. Front L to R; Ger Finn, Acting County Manager, Cavan County Council: Cllr Pat Treanor, Monaghan; Dympna McCarron, Programme Manager, CITC; Cllr Allan Rainey, (Chairperson ICBAN) and Cllr Winston Bennett, Cavan. Pictured are the Speakers at an event to celebrate the success of the HATCH Programme in Castle Saunderson on Tuesday 21st October. Cavan Innovation & Technology Centre (CITC) is a key provider of leading edge, relevant and custom designed education and training programmes to managers and key personnel in businesses located in Cavan and the wider region. The expressed aim of the company is to facilitate and support enterprise and economic development in the central border area of Ireland through the promotion of best practice in innovation, and the delivery of entrepreneurial development and capability enhancement programmes with a particular focus on training in business and the application of information and communications technology. Providing local access to state of the art educational facilities and leading edge technology. The Business Institute is a unit within the Faculty of Business and Management: Northern Ireland’s Business School at the University of Ulster. 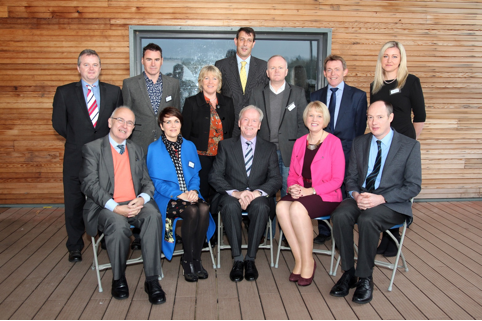 Based at Jordanstown, with the facility to operate across campuses at Belfast, Coleraine, Magee and Portrush, the Business Institute was established in response to a need for a regional centre for the provision of high impact leadership, management and organisational development initiatives. Programmes support the development needs of managers and owner managers of SMEs as well as directors and senior executives in the public, private and third sectors. The Business Institute offers in-company initiatives in addition to a wide range of open programmes and provide unparalleled local, national and international networking opportunities to its extensive client base. The Business Institute is the former recipient of Regional and National Training Awards for a number of its development initiatives. In addition the Faculty of Business and Management at the last external assessment exercise scored a maximum 24/24 for teaching excellence and the University has acknowledged the work carried out by the Institute on its behalf through the Distinguished Fellowship Award Scheme. South West College operates from four campuses in Cookstown, Dungannon, Enniskillen and Omagh and, covers the geographical area of counties Tyrone and Fermanagh. South West College used the opportunity of the merger of the four college to enlarge and expand the curriculum offer to support the regional and local economy. The College aims to provide a caring and supportive environment for all learners and a professional business-like relationship with all employers and other external stakeholders. The South West College strives to provide a quality product to all its students and to work closely with the community in which it serves. The South West College has 18,500 student enrolments, is involved in a number of European projects, has a staffing complement of some 500 full-time staff and a similar number of part-time staff. Local Enterprise Office, Cavan was the lead beneficiary of funding for the HATCH Programme and is engaged in a wide range of enterprise and economic initiatives, many of which are implemented on a partnership basis in collaboration with other development agencies, including on a cross-border basis. The LEO seeks to support and encourage new and existing enterprises through the provision of a range of enterprise supports including direct financial assistance and capability development programmes for small and micro enterprises. 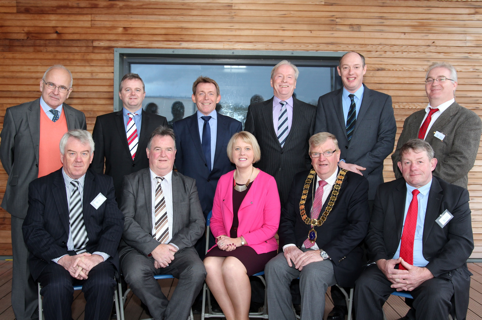 Enterprises in new emerging technologies are a key target for LEO, Cavan. It plays a leading role in supporting the stimulation and growth of the entrepreneurship base in the county. As a border county entity LEO, Cavan places a high priority on developing cross border community partnerships and projects. It works to secure funding for key projects and has been the driver of many significant local economic and enterprise initiatives implemented in the county in recent years. ICBAN – Irish Central Border Area Network was established to improve the quality of life and prosperity of the Central Border Region by creating a dynamic model of best practice and partnership in cross border development. In 1995 ICBAN was established as a network of councillors from the central Ireland/Northern Ireland border area with one common aim: to respond to the unique economic and social needs of the central border region. The Special EU Programmes Body is a North/South Implementation Body sponsored by the Department of Finance and Personnel in Northern Ireland and the Department of Finance in Ireland. It is responsible for managing two EU structural funds Programmes PEACE III and INTERREG IV designed to enhance cross-border co-operation, promote reconciliation and create a more peaceful and prosperous society. The Programmes operate within a clearly defined area including Northern Ireland, the Border Region of Ireland and Western Scotland. The INTERREG IVA 2007-2013 Programme is worth €256 million and aims to address the economic and social problems which result from the existence of borders. It has two distinct priority measures to create co-operation for a more prosperous and sustainable cross-border region.d sustainable cross-border region. Course places were open to persons in employment or unemployment who were currently or had worked in the following sectors and would benefit from the suite of education and supporting networking programmes. Courses were part-time block release, commencing in Winter 2010.